buy or sell with us, use the moving truck free! 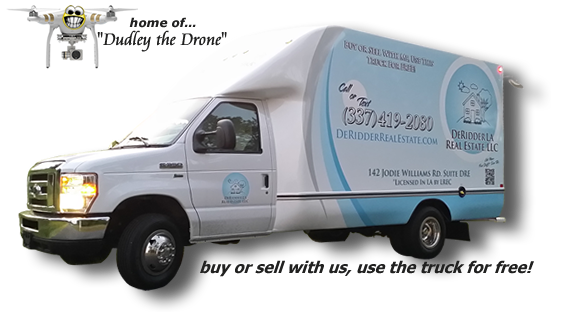 need aerial pictures with your listing? we got it free! buy or sell with us, get 3 free nights at one of our vacation properties in Silverthorne, Colorado or Orange Beach, Alabama! From employing broker, Matthew Thompson. 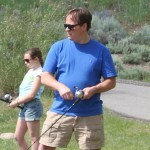 "Hello, I'm Matthew, and I like fishing for rainbow trout at a little pond I know of. I doubt you came here for lip service and pretty little lies so I'll get right to the point. I built this website so you can get the actionable intelligence you need to make a buying or selling decision. The plan is to earn your business through my company's actions, not lip service. Welcome to real estate, incentivized. Give us the opportunity to earn your business by calling (337) 419-2080 or send us a message." Search the entire MLS for real estate in DeRidder, Leesville, and around Fort Polk Army Base. This search shows every property listed by Realtors in central Louisiana. Click the binoculars to start your search, it's free! There are currently 815 properties on the market. Just listed! Find the best deals first, before many have seen them! Homes are always coming on the market in central Louisiana. Our servers update this information every few minutes. This guarantees fresher listings than any website for the area. See for yourself. Check the newest listings here and many times you will not find them on other sites because they haven't downloaded yet. This gives you the edge in finding the best deals first. There are currently 73 properties on the market that are listed for 20 days or less. Commercial Property for Sale in DeRidder Leesville Fort Polk Are you the investor type? Whether your looking for rental property or a strip mall we've got lots of fresh commercial property listings for you to look at. Currently there are 49 commercial properties on the market in DeRidder Leesville Fort Polk. There are two ways to see your home for sale in the Top 12. The first and easiest way is to list your home with us, and let us do the work! The other way is to find your home on this site and share it on as many social networks as possible. It will increase the views on your listing and eventually move it into the Top 12! DeRidder, Louisiana, is the government seat of Beauregard Parish, named after the Confederate General Beauregard. The city of DeRidder lies near the border with Texas and has a population of 10,758, according to 2012 data. It is named after a Belgian woman named Ella DeRidder Dehouyen, the sister-in-law of Jan Dehouyen, a Dutch coffee merchant who raised the $3 million needed to build a railroad from Kansas City to the Gulf. When asked to name the area along the railroad that is now DeRidder, Dehouyen chose to honor his sister-in-law. DeRidder was incorporated in 1903. Though it is small in population, it is about 45 miles from Lake Charles (population close to 72,000) and 117 miles from Shreveport (population more than 200,000). The cost of living in DeRidder is lower than the U.S. average, and the median real estate value is $149,900. DeRidder's public school system has eight schools, which include four elementary, one junior high, and two high schools, along with one alternative school. For higher educational opportunities, residents of DeRidder have plenty of choices within a short drive. Several colleges and universities are located within about 100 miles of DeRidder, including McNeese State University (Lake Charles), Northwestern State University of Louisiana (Natchitoches), Lamar University (Beaumont, TX), the University of Louisiana at Lafayette, Louisiana State University-Shreveport, and Stephen F. Austin University (Nacogdoches, TX). DeRidder's climate is mild to warm, consistent with what one might expect in the Deep South. There are approximately 217 sunny days per year. The average January low is 39, and the average July high is 93 degrees.